HELENA, MT– Carroll College will inaugurate Dr. John E. Cech as its new president on Friday, April 26, 2019, capping a week of celebration of Carroll’s students. Cech began serving at Carroll on June 1, 2018, and he will be formally installed as the college's 18th president on April 26. Cech comes to Carroll as a parent of a Carroll student and following eight years as Deputy Commissioner of Higher Education for the Montana University System, eight years as Dean and CEO of MSU Billings City College, and 13 years of service as a faculty member, director, and dean at Rocky Mountain College. After attending last year’s Student Undergraduate Research Festival (SURF) and witnessing the outstanding academic achievements of Carroll’s students and faculty, President Cech knew that integrating the inauguration ceremony with this year’s festival would make an important statement about both the current state of the college and the priorities of his presidency. This focus on providing an exceptional educational experience for Carroll’s students set the theme of the inauguration–The Year of the Student. The celebration will entail a series of events scheduled from April 23-26, beginning with with the Annual Lecture on Faith and Reason, “The Physical Nature of Christian Life” with Dr. Warren Brown of Fuller Theological Seminary in Pasadena, California, on Tuesday, April 23. Thursday, April 25, will feature the college’s Student Undergraduate Research Festival during the day, followed by a concluding lecture by Dr. Marc Kassis from the W.M. Keck Observatory. Friday’s inaugural activities begin with an academic procession and Inauguration Mass in the spectacular Cathedral of St. Helena at 9:30 a.m., followed by a reception in the Brondel Center. 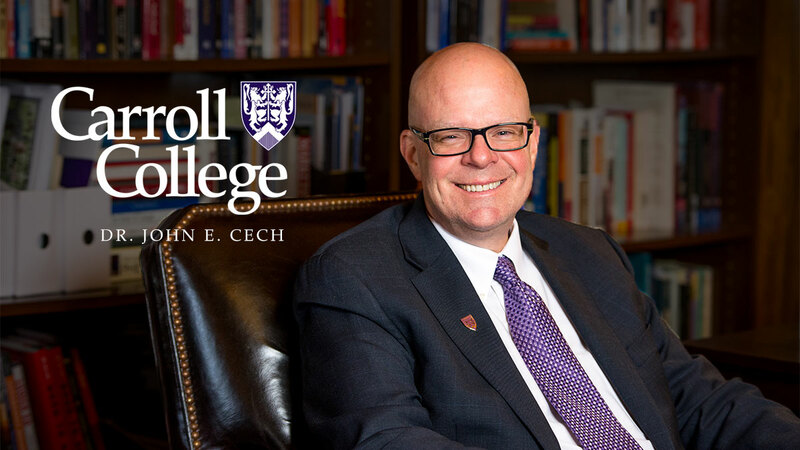 The formal installation and inauguration ceremony will take place in the PE Center of Carroll College at 3:00 p.m., April 26, where Dr. Cech will be installed as Carroll College’s 18th president. Dr. Cech will be introduced by his former colleague and friend, Dr. Waded Cruzado, president of Montana State University. A reception will follow in the plaza between the PE Center and the Hunthausen Activity Center. All of the events listed above are open to the public and all who would like to attend are welcome. For more information about the inauguration and to register online, visit www.carroll.edu/inauguration.